LIFE IS SHORT, MAKE IT MEMORABLE! There is something momentous and timeless about a purposeful, handcrafted message. Who doesn't strive to connect with, and inspire others? Bring humor and joy into the room? Make your friends laugh with a great pun, or remind them of the important little, yet beautiful, moments in life. With your creativity, our stunning unique letter boards do all of that and more - the options are truly endless! Dieter F. Uchtdorf once said, "The desire to create is one of the deepest yearnings of the human soul" And we couldn't agree more. We also believe that another foundational desire is to be understood. When you combine your honest, creative mind and find a way to express it, that is a deeply beautiful thing. 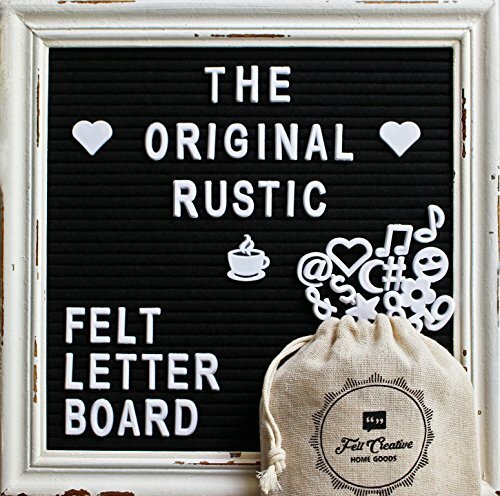 Our stunning custom-designed hand-distressed premium felt letter boards help you do just that - tell your story. STAND OUT, BE HEARD. With the vintage charm of a retro message board, create your own space that is unapologetically you! Say what you mean, and mean what you say - boldly! Utilizing letter board messages entices people to stop and read your message - they are increasingly being used for social media marketing because, plainly, it works! NOW GET CREATIVE! Get your unique letter board today, because at the end of the day, everyone could use more opportunities to express themselves and inspire others. Thank-you for supporting our small family-run business, where we strive to bring you meaningful, high quality items that enhance your life. EXCEPTIONAL QUALITY, HANDMADE FELT LETTER BOARDS. Can't decide on which letter board to purchase? Don't be fooled by cheap imitations from generic brands. Felt Creative Home Goods stands by their name and reputation. These PREMIUM QUALITY frames are built to last and the HAND DISTRESSED frames make each piece UNIQUE! EXPRESS YOURSELF WITH ENDLESS CREATIONS: Self-expression has never been easier! Your decorative message board comes with 350 ¾" White Alphabet Letters, Numbers, Punctuation, and Emojis! Our characters are high quality and stay in place. Complimentary burlap sack included to keep your extra letters neatly stowed. Including a Frame Stand for upright positioning as well as Sawtooth Hanger for seamless wall decor; the options to create and decorate are endless! SOCIAL MEDIA DYNAMITE! In a time where social media reigns supreme, our eye-catching letterboards offer you the ability capture and caption real life moments. Perfect for adding meaning and inspiration to everyday, special occasions, announcements, baby reveals, showers or for capturing an audience. Be part of the Felt Creative community - Share Your Creations and Explore Inspirations #JustFeltCreative - Mommy bloggers love us! PERFECTLY GIFTABLE: Giving the gift of self-expression but most importantly, the ability to slow down moments to make them memorable. Our stunning letter boards provide the perfect opportunity to revel in enjoyable moments. This versatile piece is perfect for weddings, nursery, store sign, restaurants, classrooms, craft spaces, home or office decor! A Farmhouse & Cottage favorite! MAKING MOMENTS MEMORABLE: Time flies, doesn't it? Imagine being able to slow down moments, caption them and make them more memorable - now you can! Letterboards remind us of what's important, offer a hilarious pick-me-up, & are conversation pieces. Reminisce these moments for years to come & use your creativity to add value to your life. Don't let life's precious moments pass you by, start making them mindful and memorable. Stop Waiting & Start Creating! If you have any questions about this product by Felt Creative Home Goods, contact us by completing and submitting the form below. If you are looking for a specif part number, please include it with your message.